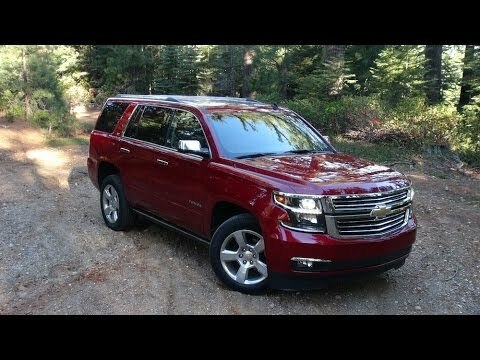 With new styling, a new chassis, a brand new interior, and all the modern technology you could want, the 2015 Chevrolet Tahoe reclaims its top-of-the-class status. It's not just better than its predecessor, it's head and shoulders above its competition, and destined to remain a top-seller. The Tahoe is like a big truck, but with the seating for a large family. The Chevy Tahoe 2015 had a cracked condenser that left me without air conditioning for 5 weeks, because the part was backordered everywhere. This was frustrating and I was disappointed that Chevy did not reimburse customers for the work. This is the only major issue I have had with my Tahoe, which I love. I spoke to my Chevy dealership about my experience. They were understanding, but because the condenser wasn't a safety issue, they were not able to do anything other than repair it when the part came in. As a family of 6 the Tahoe fits us all comfortably with our gear. The trunk space is not huge when the seats are all up, but I easily put the third row up and down when I go grocery shopping or run big errands. The navigation upgrade on my Tahoe is my favorite feature. Comfort, classy, great safety, but watch the sloped cargo space. The 2015 Tahoe looks amazing. Love thee exterior styling, has very durable tires, love all the bells and whistles on the LTZ version. Adjustable seats, heated and AC seats, very comfortable with her to or 6 people in the vehicle. Fold down seats allow for much cargo space. Only detail I detest in the cargo area is the space slopes toward the back door. Be very careful with any grocery purchases sports equipment, Etc. As they could very easily roll out the door when opened. No cargo net was provided with this used vehicle, there is no lip or rim to keep things in so you can easily have something land on your foot. Beyond that I really really like this model Tahoe. Tahoe can resolve family dilemmas. Our Tahoe is a dream vehicle that provides us with performance, reliability, and safety. On long road trips, we can have private conversations in the front while the kids are listening to a movie via earbuds in the back. The driver’s seat can auto set for 2 different drivers: short or tall; no one has to hassle with individual corrections. With a push of a button all features can return back to the other drivers defaults. Also, the third and second row of seats can retract in so you can transfer large cargo for any home reno. This purchase will not be a regret. . You’ll be referring all your friends to also purchase a Tahoe.